Haggard West was both the hero that Acropolis needed and deserved. Before the demi-god Battling Boy warped onto the planet, he was only one hero that could fight the monsters. But as we all know, Haggard wouldn’t be here forever. He needed someone to pass the blaster. Who else better than his one and only daughter, Aurora West. Paul Pope and J.T. Petty’s Battling Boy: The Rise of Aurora West, was an excellent narrative into the life of Aurora West. The book takes place before all the events of the first story. Haggard West and his apprentice and daughter, Aurora West, were the only heroes in town. And being a minor character in the first book, I would argue that her story is actually more interesting than Battling Boy’s. As a high school teen, Aurora’s daily life involves studying history, social sciences, mathematics and chemistry. But the other half of her curriculum is learning martial arts and tactics. 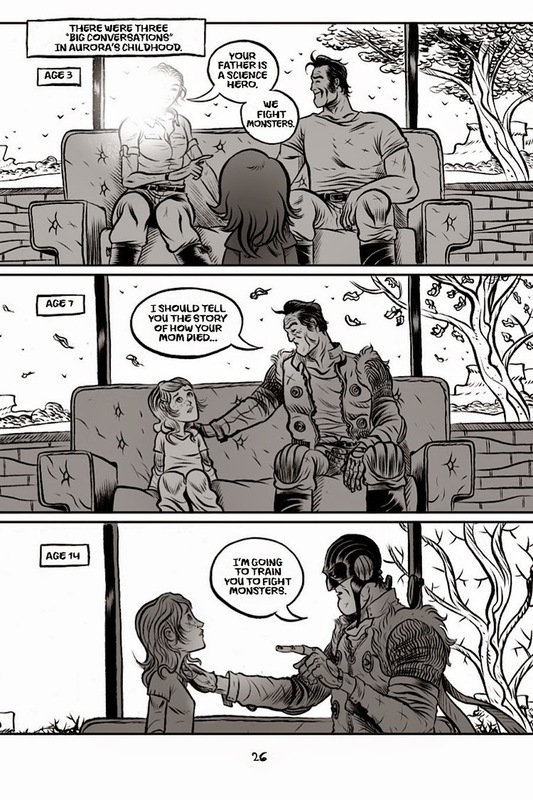 And at night, she fights monsters with her father. But the mystery begins when we dig deeper into her and her family’s past. Her mother’s terrible death years ago was in the hands of the monsters. Her father, distraught, was never able forgive himself. Haggard spent a year trying to hunt the monster that killed her but was unsuccessful. As a young child, before her mother died, Aurora had a curious imaginary friend called Mr. Wurple, this dark, cloudy being that only Aurora can see. Coincidently, when her mother was killed by the monsters, Mr. Wurple disappeared from her life. Aurora starts to unravel this mystery in the present and tries to figure out exactly what happened that fateful night. And more importantly, who killed her mother. The book is definitely heavier in content than the first Battling Boy. And I feel it greatly expands this world plagued by monsters. We get to know Haggard and Aurora more intimately. It still has plenty of high energy action. But the story, the life of the West family, is what makes this book awesome. And in my opinion, it’s better than the first Battling Boy. The story telling and writing not only meets, but surpasses the immensely popular first Battling Boy. The art is good, but it’s not by Paul Pope, but by David Rubin. And you can tell right away when comparing the books. 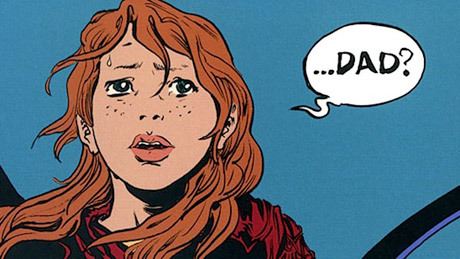 The first Battling Boy’s art is a bit more animated, colorful. 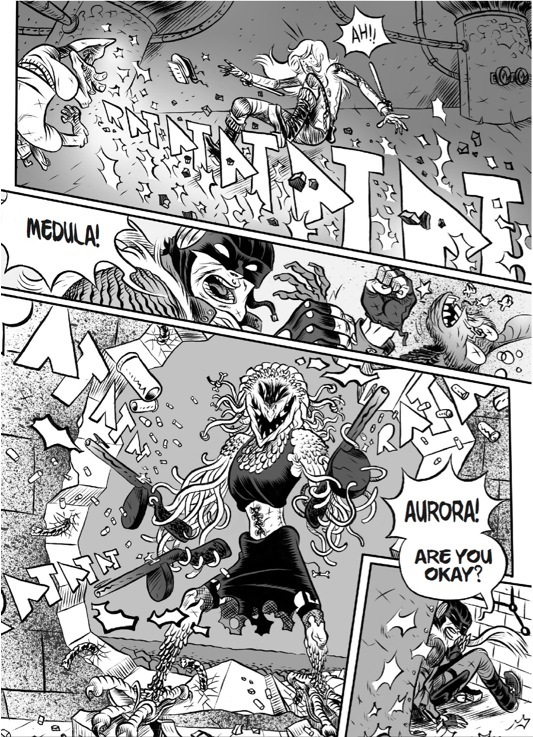 The Rise of Aurora West is in black and white, a little bit plain, but I feel it’s perfectly fine considering it’s so text and content heavy that the reader’s focus would be moving the story forward. Still, I wish it could have been illustrated by Paul Pope. This is one of my personal favorites of 2014. Though it didn’t make our staff favorites, I’m 100% sure this gets shortboxed for me. The world, the story, is so compelling. I want to read more and find out what happens next! It may be challenging to get at your LCS. Probably better to visit a brick and mortar book store such as Barnes and Noble. Or you can buy it on Amazon which is always a better price anyways.